After several days of suffering, Fabio Aru (Astana) made the greatest comeback in the Giro d’Italia when he won the longest mountain stage with a dominant solo ride on the final climb. After his teammate Mikel Landa had tried to drop Alberto Contador (Tinkoff-Saxo), he made a strong counterattack to bridge the gap to lone leader Ryder Hesjedal (Cannondale) whom he distanced to ride solo to the finish. The performance moved him into second in the overall standings behind Contador who focused and Landa and finished the stage in 6th. For several days, Fabio Aru has looked like a rider who was on the verge of cracking and many had tipped him to lose his spot on the podium in the final two mountain stages of the Giro d’Italia. Yesterday he only barely managed to protect his third place after he had been distanced by Andrey Amador (Movistar) on the Monte Ologno and so mange expected today’s mammoth 236km mountain stage to be a day of defending for the Italian climber. However, Aru has undergone a massive improvement overnight and instead of trying to limit his losses, he suddenly found himself in a position to attack. With a great solo ride on the final climb to the finish in Cervinia, he took a huge stage victory in the longest mountain stage of the race and moved into second in the overall standings. All day his Astana team had worked hard to keep a 9-rider break under control and when they hit the bottom of the final 19km climb, they had the situation under control as Giovanni Visconti (Movistar) was the lone leader with a 1.35 advantage over Pavel Kochetkov (Katusha) and a 1.55 advantage over a 38-rider peloton that was made up of Pellizotti, Stortoni, Aru, Sanchez, Landa, Tiralongo, Rosa, Kangert, Pirazzi, Moinard, Caruso, Atapuma, Uran, Geniez, Elissonde, Van den Broeck, Monfort, Amador, Intxausti, Izagirre, Quintana, Fernandez, Bisolti, Monsalve, Cardoso, Hesjedal, Zakarin, Trofimov, Kruijswijk, König, Henao, Siutsou, Nieve, Puccio, Contador, Basso, Rogers and Felline. It was Tiralongo who set the pace on the lower slopes and his hard work gradually whittled down the field. A strong headwind made it easy to follow wheels and hard for the escapees to stay clear. With 16km to go, Kochetkov was brought back and Visconti was now losing ground at a rapid rate. While Rosa and Puccio were the first riders to get dropped from the main field, the Italian was only 1.05 ahead as he entered the final 13km. Visconti realized that it was mission impossible and so he decided to sit up. With 10km to go, he was back in the fold and he didn’t even try to stay with the best. Tiralongo had been setting the pace all the way up the climb and there were no signs of any attacking until Kanstantsin Siutsou (Sky) finally tried a move with 9km to go. That was the trigger for Astana to play their next card and it was Luis Leon Sanchez who launched Mikel Landa in a big attack. Landa flew past the fading Siutsou but Alberto Contador and Ryder Hesjedal were glued to his wheel. As he stopped his acceleration, Aru, Steven Kruijswijk (LottoNL) and Rigoberto Uran (Etixx-QuickStep) made the junction. Hesjedal used the standstill to attack but Kruijswijk didn’t give him an inch. This allowed Leopold König /Skt) to join the group while Uran dropped off. Aru now tried his first attack but he had no luck. Instead, Hesjedal tried a move and no one responded to the Canadian who quickly got a big gap while König was dropped. Landa made his next attack but Contador, Kruijswijk and Aru were glued to his wheel. The Basque kept riding on the front for a while, setting Aru up for the decisive attack which was launched with 8km to go. The Italian got an immediate gap and started to get closer to Hesjedal while König rejoined the Contador trio. Riding for GC, König and Kruijswijk worked well together but they constantly lost ground to both riders in front of them. Further back Amador, Benat Intxausti, Damiano Caruso, Mikel Nieve, Tanel Kangert, Alexandre Geniez and Uran formed the next group in which Movistar were working hard. With 6km to, Aru caught Hesjedal and he only took a few seconds to recover from his effort before he attacked again. The Canadian did his best to stay with him but finally had to surrender. With 5km to go, Aru was 15 seconds ahead of Hesjedal and 45 seconds ahead of the main group. Uran, Kangert and Nieve had now attacked out of the chase group and moments later Uran made the junction. Nieve and Kangert also made it across and the Basque went straight to the front to work for König. Hesjedal constantly stayed around 25 seconds behind Aru but he never got any closer, even when they hit the flat final 2.5km. Meanwhile, Uran attacked out of the Contador group and managed to build an advantage of 15 seconds. There was no one stopping Aru who held on to take a big solo victory while Hesjedal had to settle for second. Uran held on to take third before Kangert won the sprint for fourth. With the win, Aru moves into second overall but he is still 4.37 behind Contador who defended his lead. He now only faces one big test before the final stage to Milan but it won’t be easy in the penultimate stage of the race. After a mostly flat ride, the riders hit the famous Colle delle Finestre with its tough gravel roads before they descend to a rather easy final climb to the finish in Sestriere. After yesterday’s huge drama, more climbing action was in store on stage 20 which brought the riders over a massive 236km from Gravellona Toce to Cervinia. After 150 mainly flat kilometres that only included an early category 3 climb, the riders got to the difficult finale where they would tackle three big category 1 mountains in quick succession. The final challenge was a 19.2km climb with an average gradient of 5% and it led directly to the finish line in Cervinia. Again the riders were lucky to escape the rain when they gathered for the start of the longest mountain stage of the race. There were no non-starters when they headed out for their ride for one of their earliest start of a stage in this year’s race. For many riders, this was the penultimate chance to win a stage and so it was no surprise that it was another brutally fast start to the stage with numerous attacks. Again it took a long time for the early break to be formed as Tinkoff-Saxo patrolled the front to make sure that the break had the right composition. After 25km of racing, the peloton was still together and it took another 10km before the elastic finally snapped when Carlos Betancur, Matteo Montaguti (Ag2r), Marek Rutkiewicz (CCC), Diego Ulissi (Lampre-Merida), Giovanni Visconti (Movistar), Esteban Chaves (Orica-GreenEDGE), Pavel Kochetkov (Katusha), Nick van der Lijke (LottoNL-Jumbo) and Vasil Kiryienka (Sky) got clear. However, they had to work very hard to get a significant advantage as Androni had missed the move and were chasing hard behind. At the 41km mark, they were still only 25 seconds ahead but finally the peloton slowed down after a brutal first hour during which they had covered 50.3km. After 57km of racing, the gap had gone out to 2.39 and 8km later it was 3.40. The gap continued to grow and when Betancur won the first KOM sprint, the gap was up to 4.14. At this point, Enrico Battaglin (Bardiani) who was ill, left the race. At the 105km mark, the gap reached a maximum of 4.40. Meanwhile, Betancur suffered a mechanical problem after Visconti had won the first intermediate sprint. Astana took control of the peloton and when Visconti won the second intermediate sprint, they had reduced the gap to 4 minutes. At the bottom of the first big climb, it was down to 3.23. Betancur was the first to get dropped from the front group and later Montaguti and Ulissi also lost contact. Chaves and Visconti got clear. 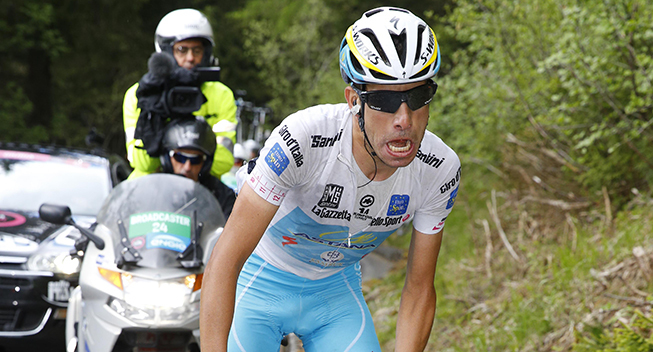 The Italian dropped his Colombian rival who fell back to Kochetkov and Kiryienka who were the nearest chasers. Halfway up the climb, Visconti was caught by his three chasers while Rutkiewicz was trailing by 19 seconds. Betancur, Ulissi and Montaguti were all caught by the peloton in which Dario Cataldo was setting a fast pace for Astana, 2.30 behind the leaders. Rutkiewicz regained contact 2km from the top but Visconti made an immediate attack that allowed him to crest the summit as the lone leader. His four chasers followed just a few seconds later while the battle for the mountains jersey started in the peloton when Benat Intxausti (Movistar) attacked. Kruijswijk was quick to respond and passed van der Lijke just before the top where Intxausti won the sprint for sixth. Van der Lijke, Intxausti and Kruijswijk tried to continue their attack while Visconti waited for his chasers. Rutkiewicz briefly got a gap on the descent but the front quintet came back together. However, they were losing ground and with 50km to go, they were just 2.25 ahead. Cataldo set the pace all the way down the descent and with 47km to go, he had brought the Kruijswijk trio back. As they hit the penultimate climb, the gap was only 2.10. Visconti launched an immediate attack and only Rutkiewicz could initially stay with him. However, the Pole was quickly distanced and passed by Kiryienka and Kochetkov while Chaves cracked completely. Cataldo set the pace on the lower slopes of the climb while Kochetkov dropped Kiryienka. The peloton was gradually getting smaller while Visconti extended his advantage to 2.55 with 38km to go. Chaves, Rutkiewicz and Kiryienka were all caught before Diego Rosa took over the pace-setting for Astana. He upped the speed significantly and Visconti now started to lose ground. With 30km to go, he was 2.10 ahead of the peloton while Kochetkov was at 1.10. Salvatore Puccio launched a brief attack from the peloton but he was quickly brought back when Kruijswijk made the expected attack. Intxausti responded to the move and those two sprinted for third place after Visconti and Kochetkov had crested the summit. Again the Basque turned out to be the fastest and again the pair sat up to wait for the peloton. Rosa set the pace on the descent before Luis Leon Sanchez took over in the final part. As soon as they hit the final climb, it was Tiralongo who took over and set the scene for the exciting final battle.